Brian Mitchell was a quarterback originally at Southwest Louisiana. An amazing athlete, he owned virtually all the quarterback records when he left the college and was the first NCAA player to throw for over 5,000 yards and rush for over 3,000 in their career. 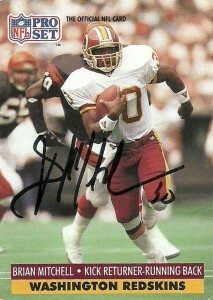 After graduating from college, he was drafted in the 5th round of the 1990 NFL Draft by the Washington Redskins. The Redskins were deep at quarterback so the team decided they’d throw him back there as a return specialist, runningback, and as emergency quarterback. 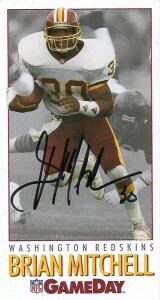 Brian would rack up the return yardage playing for the Redskins through 1999. An electric returner, Mitchell led the league in punt return yards with 600 in 1991, and was a ProBowl selection in 1995 for the team. In 10 seasons with the Redskins Brian left holding virtually all the Redskins special teams records, racking up over 16,000 yards from scrimmage and 7 punt returns for touchdowns. After leaving the team, he’d play for the Eagles from 2000-2002 and continued his assault on the record books, setting a league record at the time with 206 kick return yards in a single game. 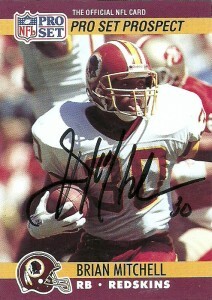 Brian would play one final season for the New York Giants in 2003, before retiring as a member of the Redskins. When I initially started this project, Brian was one of the players that I really wanted to honor. Incredibly upon retirement, Mitchell was ranked 2nd all time in yards from scrimmage, had 4 seasons of over 2000 yards, and holds the NFL records for kick returns (607), combined return yards (19013), punt return yards (4999), career kickoff return yards (14014), career fair catches (231), fair catches in a season (33), and punt returns (463). Still most people are unaware of the legacy Mitchell left upon the game and he probably won’t see the Hall of Fame, because of the lack of respect for special teamers. In the meantime, he was inducted into the Redskins Hall of Honor in 2009, works on his foundation (Brian Mitchell Foundation), and has been involved in broadcasting. I was pleased to get Brian’s autograph in 10 days flat from his home in Louisiana. Great cards of Brian here. ProSet really did their homework and had a card of him before the end of his rookie season in their 1990 update set which was far and ahead of anything anybody produced by at least a year. Oddly he’d appear in both of Pro Set’s 1990 and 1991 update as the last card in each set. (Sure there were additional inserts after him, but he was the last actual player card.) 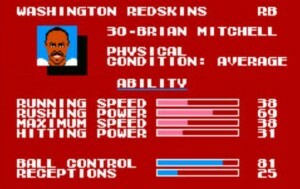 Mitchell was pretty decent in the first Tecmo Super Bowl, but by Final Edition, he was a dangerous threat in the game. Much like Mel Gray, Brian was a threat to return the kickoff every time he touched the ball and the secret to utilizing him correctly was basically to put him in the starting lineup.